Capturing notes in a classroom lecture or business meeting can sometimes be a daunting task. And, if you’re like me, the race to capture the spoken word and put it on paper can sometimes keep you from listening to what’s being said next, leaving your notes with Grand Canyon-sized gaps that limit their usefulness. 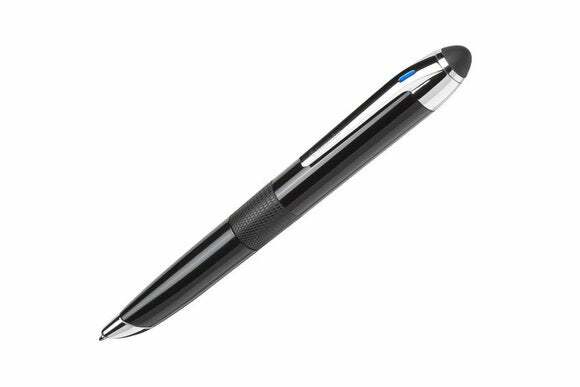 The Livescribe 3 Smart Pen and associated Livescribe+ app for iOS are designed to change the way you capture information, helping you take notes while the app and pen track what’s being said in classroom, meeting room, and lecture hall. The way Livescribe works is fairly simple. You need three components: A Livescribe smartpen, Livescribe notebook, and the Livescribe+ app. The app is a free download from the App Store and works on third generation and later iPads and fifth generation iPod touch and the iPhone 4s and later. The pen and initial notebook can be purchased in standard ($150) or pro ($200) editions, each of which includes a pen and enough special notebook pages to get you started. The difference between the standard and pro editions is the accessories that come as part of the kit. Pro includes a leather case and a one-year Evernote subscription. The Evernote subscription just about makes up for the difference in price, so if you’re an Evernote user or want to be one, the pro version is definitely the better choice. Before you begin you need to pair your pen with Livescribe+ on your iOS device, a task that takes just a few seconds using a device pairing link that appears at the beginning of any Livescribe notebook. 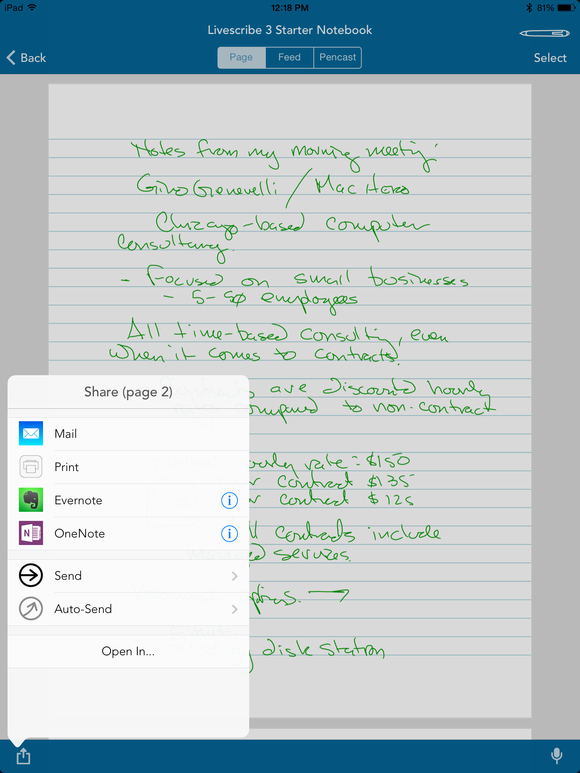 Once paired, you tap your pen on a link at the bottom of any notebook page to begin recording and taking notes. Once you begin recording, taking notes is no different than normal, except that the Livescribe+ app, using the pen, also begins capturing audio and your written notes—as you’re writing—appear in the Livescribe+ app at a slight delay behind what you’re writing on the page. When the lecture is over you use the Livescribe+ app to listen to and, if necessary, update your notes as your re-listen to what was said. The app highlights your notes as you go along so that what is being said and what appears on the page is exactly in sync. 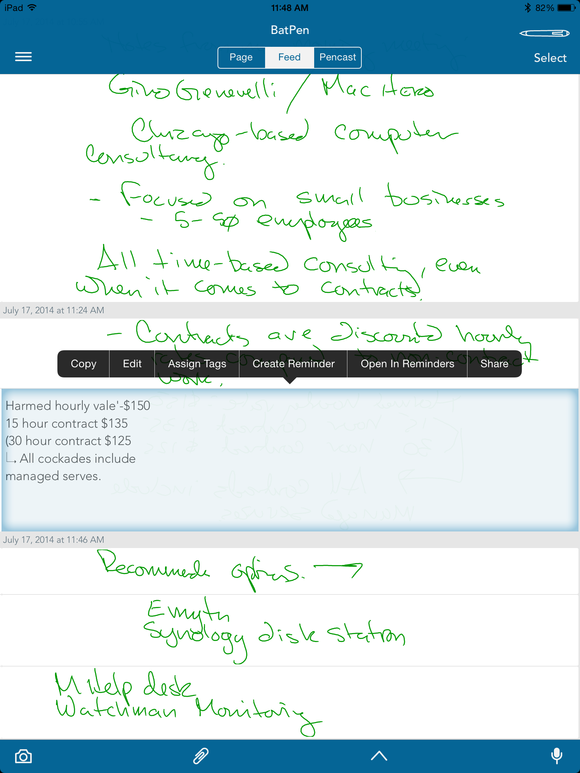 Once Livescribe+ has captured your notes and audio, it can turn your written notes into editable text. While Livescribe+ is great at capturing your writing and audio as you take notes, the app also makes it possible to turn your written text into typed text that you can then edit in the app’s built-in text editor. The app’s script-to-text conversion is pretty good, but it is very penmanship dependent. My penmanship is abysmal, so the resulting text was sometimes closer to sanscrit than English. But correcting what I wrote was very easy and those with better handwriting will have much better success. In addition to capturing your written notes and related audio, Livescribe+ offers tools for organizing your notes and the notebooks those notes live in. Every time you use Livescribe 3 to capture your notes, a timestamped reference gets created in the Livescribe+ app. Special buttons at the bottom of each Livescribe notebook page can be tapped during the course of a lecture to tag, favorite, or flag a page. Everything you capture using the Livescribe can be emailed and printed directly from the app and if you use Evernote or OneNote, an image of your captured page can be sent directly to the account for which ever app tool you’re using. Livescribe offers a variety of notebook options—from Moleskine-like notebooks to your typical spiral notebook—starting at about $6, but if you have a color laser printing capable of printing Postscript files at 600 dpi, you can print your own notebooks at home for the cost of paper, toner, and electricity. The biggest problem I continue to have with the Livescribe system is the size of the pen. I’m no dainty boy, my hands can span an octave-plus on a piano with little effort, but I find the Livescribe pens to be uncomfortable to use. The barrels are too big and bulky and tend to be a little top heavy. For me, this results in tired hands after just a few minutes of note taking. 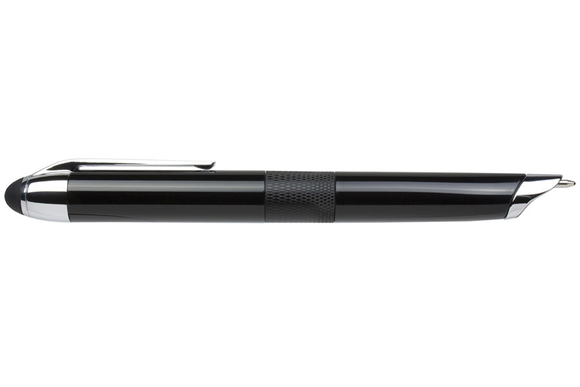 Your mileage may vary, but I’d be happier with a more streamlined version of the Livescribe pen. This may be a wish that’s impossible to fulfill, as the window near the pen tip that holds the camera that captures your writing needs to be pretty big in order to do its work. Use Evernote or OneNote? Livescribe+ puts uploading your notes a tap away. The addition of an app for collecting, managing, and turning your notes into text in realtime is a huge plus for Livescribe. While I prefer better writing instruments than what Livescribe currently offers, the ability to capture what I listen to as I write notes and then play that back to update and correct my notes makes Livescribe 3 an excellent alternative to basic pencil and pad note taking.